Google Play Store shows Error code 404 on downloading or updating apps! Whenever I click to download a new app the Play Store shows an error 404. I am trying since morning with no luck. 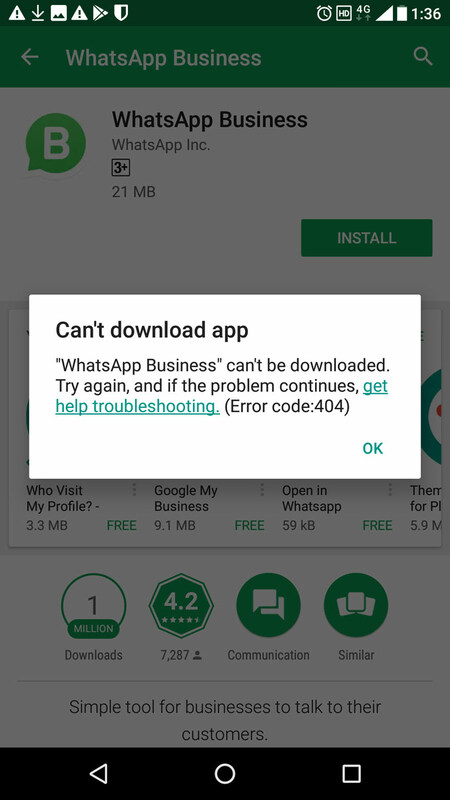 It says "WhatsApp can't be downloaded. Try again, and if the problem continues, get help troubleshooting. (Error code 404)." I have even tried the troubleshooting guide but there is no mention of the 404 error. All pages of Play Store do load fine. It also shows me app updates. But every time I try to update or download the app, it stops immediately with the 404 error. Does anybody have a clue to fix the issue? Error 404 generally means a "File not found". So, if Play Store follows the general guidelines, then there is something wrong with the Google server causing the download request to fail with a "not found" 404 error. I can see that many posts appeared on the internet in the last 2 or so days; with users facing the same issue. So, it could very well be an issue or change which Google made to its servers. I just want to tell you that you're not alone. And you should not factory reset your phone yet, because that will not solve the issue. What device are you using btw? Also, is it a Google certified device? Did you import it from another country or it was sold directly in your country by the manufacturer. These would help in eliminating the issue. Do also check on the other devices within your family if anybody is facing this as well. I am using a Mi 5 from Xiaomi. I imported it from China via a friend. Does importing it cause an issue? It's been several months that I am using it and Play Store worked fine all the way. What would happen suddenly? I have the same problem on my Huawei Mate 9. Any solutions there? Seems like Google found a way to ruin my February. I am no longer finding any problem with my phone. But IDK what to do anymore. I need to install an app to control my Android TV but I could not! Already lost my data, what else now? @lame_dog me too.nokia 7.can your device work now? Not yet bud. Still facing the same issue. Error 404 on whatever app I try to download.